……is a messy little kitchen, uncoördinated spice racks, dirty utensils, floor with vegetables bits and glasses with lip marks from the greasy food you just served. Yawning guests settle themselves on the sofa like sumo wrestlers too tired to speak after a hefty meal. A few guest fuss impatiently eager to go home but are bound by societal norms from doing so. Dusty footprints marred the white tiled floor breaching the day’s hard work and at the end of the phone line a sulking boyfriend annoyed by the fact that you just didn’t have enough time for him, the validation of a long distance relationship. Half-filled glasses perched on every table with an occasional guest nursing an almost empty glass. Empty bottles lounged on the floor and pudding bowls scattered like lost words hidden in lies. You hide the exhaustion, the sleepiness but your eyes betray the pain and you manage to hold on because it is worth every ache in your body. Red wine stained your new ivory satin sofa cushion and makes it stand out like nudist at a comic-con but you won’t go ballistic and grinch like Kim Kardashian because that’s just rude and impolite. But you know you’re googling tomorrow to find a way to remove those stains. Most of your dishware piled up on the sink unsettle and when the sink’s won’t do, the adjoining countertop already laden with random heaps of mess is yet overwhelmed with another batch of dirty dishware smudged with everything from homemade sauce to unrecognizable greasy drippings. And the moment of truth arrive, followed by a bruised ego when you see your very distinguished slow-cooked pork whose recipe you keep it a secret and carefully prepared with special attention lying untouched and rejected on that one plate like a nerdy high school boy bombarded with acne. And the crazy monologue stirring inside your little egoistic head of the why and the whys the pork is not eaten or the realization that maybe it’s not as good as you assume. You shudder at the thought of tomorrow. The disorder. The dregs. The though of major cleaning the house again after you just did it today. The kitchen alone is a whirlpool of mess and when you invite ten people over for dinner and you play the multiple role of a host, planner, chef and the cleaning lady, a little whining is only plausible. And no matter how much you love to cook this is the one part you took no delight in because after you drain almost all your enthusiasm and vigor on serving the perfect meal the tiny remaining part only wish to slumped to bed and sleep like a log. You know very well that after a perfect meal for ten is a disorganized mess. And after the last guest leave, you glanced around the room ironically admiring the chaos; picking up few things here and there leaving the rest for tomorrow’s labor. Then you sit momentarily – recapitulating seconds gone by of the dirty jokes with the roar of laughter still glistening in the environment, the faces of guests as they savor the food, the clinking of glasses as the toast were made and the eyes of a content guests as they compliment the food. Suddenly the mess were only a mess. Temporary. And the silk cushion – only a cushion. And the eyes behold beauty in the unexpected. You beam. The ticking of clock shows that it’s already an hour and a quarter pass bedtime. So you dragged your comatose legs to the bedroom, dutifully remove the make-up, washed up, slipped into your shorts and collapse to bed knowing fully well that you would do it again any day, come what may. ← Ode to men lost at sea. Great post!! 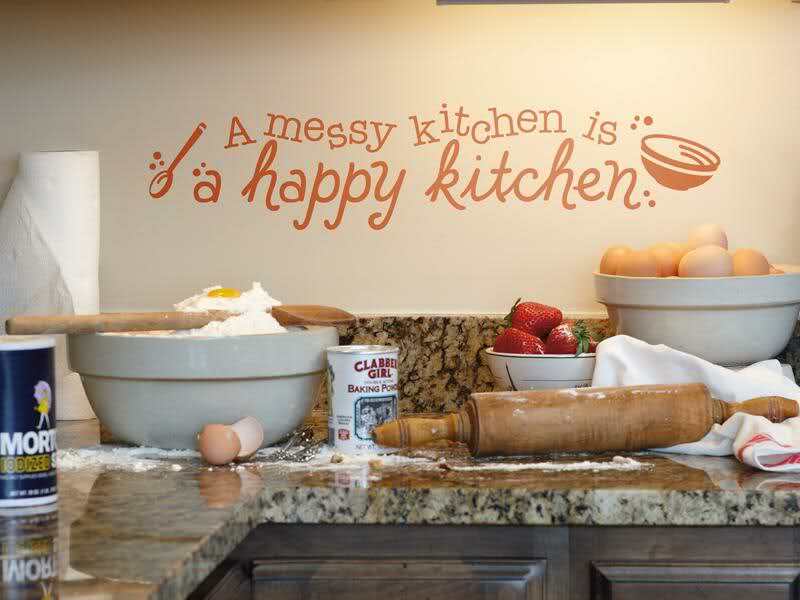 Love the quote, I need to stencil that on my kitchen wall!! It was nice reading it.. Thank you 🙂 very very much. I am glad you like my blog post, Rain. I live where it is frequently very dry and seems to get worse every year. Do you really live in Delhi? I visited there once a long time ago, but my favorite place was Kashmir. It is so beautiful there. Yes I really live in Delhi but originally Im from the north-east part of India called Mizoram…You should visit there too..beautiful place 🙂 .You are very lucky to visit Kashmir..I’ve been planning to go there too.And oh yes I love your poem Rain 🙂 It is simply beautiful…Keep writing and do read my poems too. God bless.